Sadio Haidara – who is out of contract this summer – is in the club’s squad for the game at Watford today. We’d be surprised if the 25-year-old gets a start, but he may come on as a substitute. Haidara was signed for around £2M from Nancy back in January of 2013 when we were struggling against relegation, but he has played only 48 times in his six and a half years at Newcastle. His contract will not be renewed at the end of June when it runs out. So none of the loan players are needed for the last couple of games at Tottenham and at home to Chelsea. 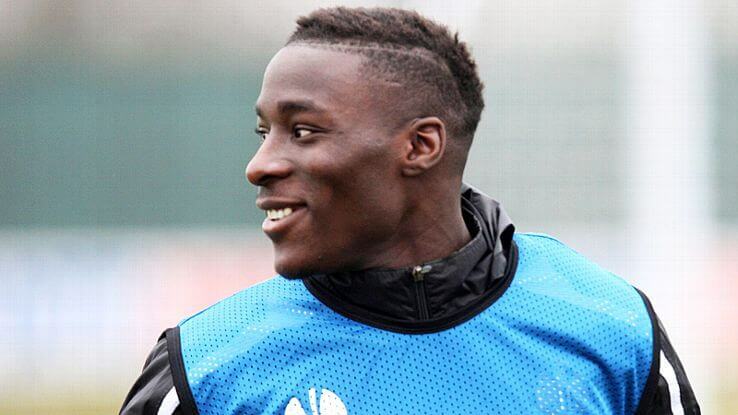 Haidara has played once this season for Newcastle in January’s FA Cup defeat to Chelsea at Stamford Bridge. And for loan players like Adam Armstrong, Aleksandar Mitrovic, Matz Sels, Jack Colback and others – they will all likely be made available for transfer this summer. Rafa needs to have a clear-out before he brings in new and better players to the club. Only goalkeeper Freddie Woodman and some other of our younger players on loan will still be at the club come September. How Will Newcastle Fare At Watford? “West Brom will be relegated if they fail to beat Tottenham. They will even be relegated without kicking a ball if Stoke win the early kick-off and will also be down if Swansea avoid defeat or Southampton win. “Stoke will be relegated if they lose to Crystal Palace. If the Potters draw, they’re down if Swansea avoid defeat or Southampton win. Even if Stoke win, they’re down in the unlikely event that Southampton, Swansea, Huddersfield (who don’t play until Sunday) and West Ham all win. Good afternoon Ron…anything specific you were thinking about in terms of your reply earlier to my comments about leaving everything too little too leave at Newcastle? I am starting to believe that we as supporters should be prepared to be accepting what life will be like on Rafa leaving. I strongly believe that he will leave with another opportunity lost and we will revert to supporting a club run under Ashley’s rules. Ashley has proven in the past to be very stubborn and does not bow to mere mortals. So can’t see him agreeing to back our Rafa. This I’m afraid is how I see it. Didn’t you know “Too little too late” and “Going through the motions” are the club’s mottos under Ashley? oldgit1, I HOPE YOU’RE WRONG, But it’s starting to look as if it’s getting closer to that. You ever wonder why Sewage workers are so depressed? They’re always down in the dumps. We’re 5/2 to win tonight against a poor Watford side. Got to have a piece of that! It seems to be Justin Barnes, acting for Ashley, who puts a block on Rafa’s plans. What was that you quoted from Jail about me ‘gloating’ over some ‘Pards’ cup victory over Liverpool in a recent post ? Sounds as if the clown is trying to stir things up again. Mag52, not sure. Just ‘Jail’ doing his usual silverback routine I guess. Assuming Rafa is planning to stay then now that we’re safe he will be plotting and scheming for next season. As he pointed out himself owners are aware that he can take cheaper players and mould them into useful ones. This could prevent him getting the type of players he really wants. Is Ashley going to sanction paying out decent fees for proven quality or try and fanny Rafa along in the knowledge that he will keep us up with the minimum spend on players that will just about do the job. This is the ideal scenario for Ashley and what he has wanted for a long time now. Ancient ……… You are Lesh will obviously be hogging the far left touch line for the full 90 mins. Jib……… I see you put Lesh up front on the right. He won’t be happy there! Good day Jesper…….. Will you be watching the game today? Going toon 2..1 or 2..2 and i think we should hang back from renewing or season tickets till we see how this pans out with ashley and rafa enjoy the game lads. What else can Rafa do if Ashley/Barnes don’t give him their backing? Rafa is very organised. He obviously had a plan! Haven’t been able to catch up with comments so excuse me if I repeat anything someone else has said. And this has to be a quicky as the missus has me building a small storage shed out of some old scaffold boards, I have said that I’m stopping at 2.30 to be present for our winning game at Watford. Haven’t a clue what Rafa is going to do today but will be surprised if there’s many changes from last week apart from the obvious one, Gayle staring. Watching the Marseilles/Salzberg game I reckon we have the wrong Haidara! 2 hours 28 Minutes to KO. It’s a lovely weather today Betsy and a lot of activities plans! We’ll see. How about you? Nothing planned I suppose! Think I’ll go for a draw today. Watford are there for the taking but so we’re the last to teams. Watford’s manager is under pressure and could be his last game. If the team don’t want him there they could do a Leicester and not play well for him if they want shot of him!! I’m waiting for Dubai micky to provide my Saturday links!! Jesper………I’ll be trying to find a stream that works on my iPad later. I’ve put a casserole in the slow cooker so I don’t get distracted having to worry about dinner. Jib…sorry, bit late to the party. I was going to complement you on your sh!t jokes but that might have been misconstrued. Sorry ben.g, nothing around just yet. This is a fall back though (it’s never the clearest). Here’s hoping the previous couple of games has served as a cautionary tale for over confident complacency. I certainly won’t be saying 0-3 as a prediction. I’d like us to win. That’s fantastic Betsy! Life is just so simple isn’t it…beautiful! Ron…you’re dealt the cards your dealt and you either accept that or move on! …in the meantime you plan according and move forward…you don’t put all your money on Abraham signing and if that doesn’t happen your screwed! Stoke score with a peach of a free kick just before half time. Bugger.